Everyone is familiar with the parable of the good Samaritan from the Gospel of St. Luke. Even before entering the Catholic Church in 2006 I had heard this familiar story proclaimed in various Protestant churches. In the past, however, I had always heard this parable explained strictly as a morality tale, meant to redefine and expand our understanding of neighbor and to realize that our Christian discipleship requires us to demonstrate charity for all. To tell the truth, however, this has been my only understanding of the story. What I learned today at Mass is that the good Samaritan is indeed a very Catholic parable. For those who may not attend the Extraordinary Form of the Mass, today was the Twelfth Sunday after Pentecost and the Gospel reading was from Luke x. 23-37. Those of you who participate in the Ordinary Form just heard this Gospel reading a few weeks ago. A very holy priest of my diocese introduced us today to the allegorical reading of the parable. As he explained, nearly all of the fathers of the Church had interpreted this parable in the manner in which he was presenting it to us. A quick review of the Catena Aurea of St. Thomas Aquinas confirms this. From St. Augustine, to St. Bede to St. John Chrysostom, all address the allegorical depth of the parable. “The man who went down from Jerusalem to Jericho,” says St. Bede, “is Adam representing the human race. Jerusalem is the city of heavenly peace, of that happiness from which he has been separated by sin. The robbers are the devil and his angels, into whose hands Adam fell, because he went down. They stripped him and robbed him of the glory of immortality and the robe of innocence. The injuries they inflicted upon him are sins which, violating the integrity of human nature, let death in through half open wounds. They left him half dead because they deprived him of the blessedness of eternal life, although they could not abolish in him the faculty of reason by which he knew God. The priest and the Levite who saw the wounded man and passed by denote the priests and ministers of the Old Testament who could only show up the wounds of the sick world by the decrees of the law, but could not cure them because, as the apostle says, it was impossible for them to wash away sin with the blood of calves and lambs. The good Samaritan (the word means guardian) is our Lord Himself. Having become man He is brought close to us by the great compassion He has shown towards us. 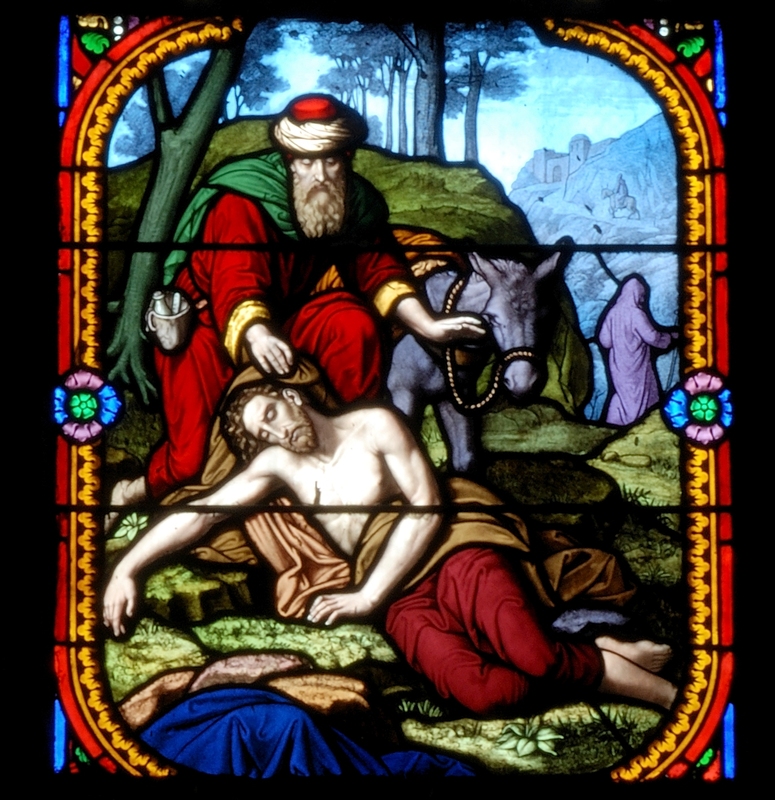 The inn is the Church into which our Lord Himself brings man, as the good Samaritan brought in the wounded man on his beast, for no one can take part in the Church unless he is baptized, united to the Body of Christ, and carried like the lost sheep on the shoulders of the Good Shepherd. Today was once again a great reminder of just how truly “Catholic” a sermon (or homily) can be. I have attended parishes in the past, as I am sure many of you have, in which the sermon could very well have been given in a Protestant church and not a single word would have required changing. It is the great challenge and, I would argue, commision of our clergy to always strive to provide the laity with sermons that embrace the wisdom and tradition of our two thousand year old Catholic faith. How blessed we are to have such a rich patrimony! How gratfeful as Catholics we should all be for the great saints and doctors of the Church through whose wisdom we can better understand the sacred scriptures. I am also grateful for Father’s sermon at Mass and for being introduced to this allegorical understanding of the parable of the good Samaritan. I would love your feedback. Have any of you heard this parable explained allegorically before, particularly at Mass? Posted on August 11, 2013, in holiness, liturgy and tagged allegorical, catena aurea, dom levebvre, good samaritan, st andrew daily missal, st bede, venerable bede. Bookmark the permalink. 6 Comments. Those fluffy homilies on such a rich parable are too often. Someday…it may improve? From what I have seen of this younger generation of clergy(45 and under) seems very promising. Hopefully an indication of both the holiness of the men responding to the call to the priesthood, along with the improvement of our seminaries. We heard this exact interpretation at our EF Mass today, August 30 2014. It was a wonderful example of the depth and richness of our Faith. The priest mentioned that there are several interpretations of what the oil and wine are that were used to heal the Samaritan. I was conscious of these elements mentioned in the Communion verse and wonder what they signify: a restoration of Adam to a state of sanctifying grace and enjoying the generosity of God’s benevolence? Perhaps you could suggest something! I’ve been told that the tale means “love everyone@, but it doesn’t seem to say that – it reads more subtle and complex. Christ could have simply said “everyone” in response to “who sunny neighbor” but this tale distinctly posits at least two people who are not the fallen mans neighbors. We are not, in this tales reading, the Good Samaritan – we are the fallen man.